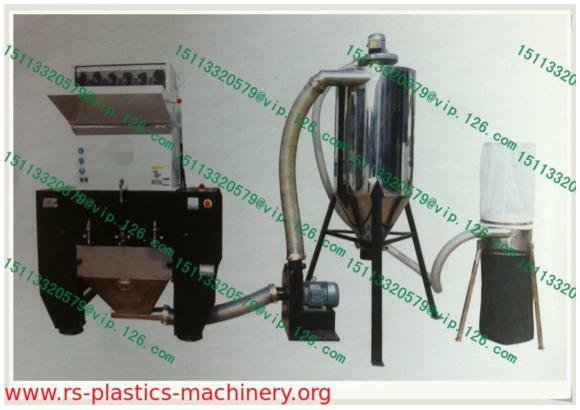 A, The device is equipped with strong granulator, during granulating process, some small powder will produced, the function of the sifter device is separate the powder from the recycled granules and to keep them compatible with the new materials, so that to improve the quality of the products and to reduce the production cost. B, Automatic conveying---with vacuum suction principle, the granulated materials will be automatically conveyed to a separator. C, Automatic separation of powder--- to separate the powder that produced during the granulating process from the granules by a separator. D, Protection and dust removing function--- the powder sifter device can take away the dust on blades and inside the grinding chamber as well, hence reducing the workload of manual cleaning of the grinding chamber. E, The Automatic powder sifter device is suitable for all kinds of granulators. We reserve the right to change specification without prior notice. please contact us for E-catalogue and Price Lists!